One of the most popular sights to see in San Diego is the La Jolla Children's Pool, until recently home to a colony of San Diego harbor seals. 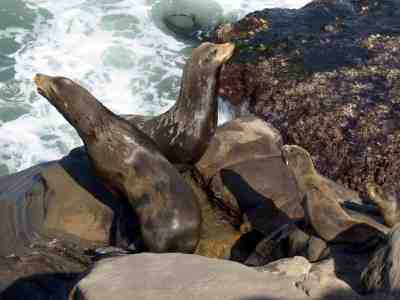 Although the beach was donated to the city of San Diego to be used as a children's beach, the seals took it over. This has been quite controversial, and recently you will find that humans are back on the beach, not the seals. 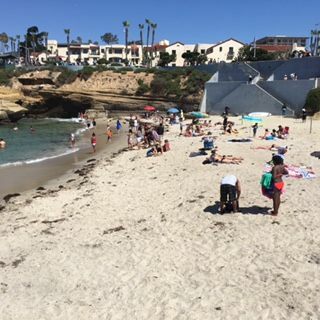 Still, if you want to take your children to a great La Jolla San Diego beach to play in the water or sand, I recommend La Jolla Shores instead. 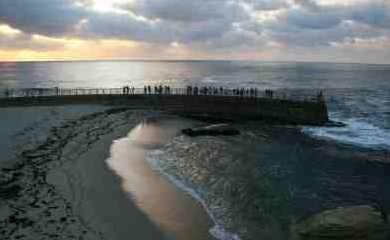 The La Jolla Children's pool is a small beach protected by a sea wall in the heart of La Jolla. Families to relax and enjoy this beach, which until recently was occupied by seals. Most visitors to the beach look at the beautiful views and the seals, and don't actually wander down onto the beach. If you visit and you are allowed on the beach, please do not get too close to the seals if they are present in the water or on the sand. Parking: Limited free parking on Coast Blvd. or in one of the paid parking lots in downtown La Jolla. Getting There: Short walk to the beach from parking areas. Enjoy to beautiful La Jolla coastline. 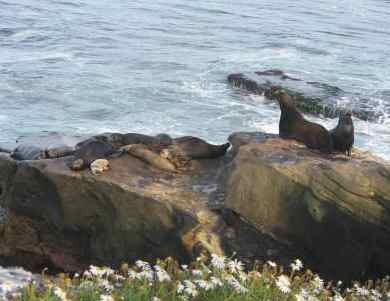 Things to Do: Swim, sun bathe, watch the seals, look down in the clear water at the sea life, walk along the La Jolla Coast walk to La Jolla Cove and the La Jolla Sea Caves. 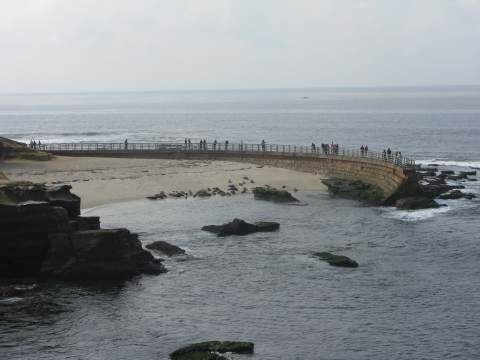 Facilities: Restrooms, trash cans, concrete seawall, concrete walkway along the scenic La Jolla coast walk. Services: Many restaurants, bars, and hotels nearby in downtown La Jolla. High Tide Access: At high tide, the view is nice from Coast Blvd. At low to medium tide, you can walk out along the sea wall for a closer view of the beach, and the marine life. Things NOT to Do: No disturbing the seals, no surfing, no boogie boarding, no alcohol, no glass containers, no smoking, no littering, no disturbing noise, no overnight sleeping, camping or parking. Disability Access: Some disabled parking and access along Coast Boulevard. No direct access to Children's Pool, but you can enjoy the concrete sidewalk along the coast which offers spectacular views. Hazards: Dangerous rocks, rip currents if you venture very far off this small sandy beach. You can also get a closer view of the La Jolla seals near La Jolla Cove, just a short walk away along the La Jolla Coast Walk. Directions to La Jolla Children's Pool (Seal Beach) from the north - From Interstate 5, go west on La Jolla Village Drive, left on Torrey Pines Road, and right on Prospect Street. Watch for the signs and bear right on Coast Boulevard (take the second entrance if the first one looks busy). Directions to La Jolla Children's Pool (Seals Beach) from the south - From Interstate 5, go west on La Jolla Parkway, continue on Torrey Pines Road, and right on Prospect Street. Watch for the signs and turn right onto Coast Boulevard (take the second entrance if the first one looks crowded).